Warren Murphy and Richard Sapir wrote The Assassin's Handbook in 1982. Murphy here teams up with a great Destroyer author: James Mullaney. Together, they bring you the all-new readers' guide to the past thirty years of America's greatest adventure series! 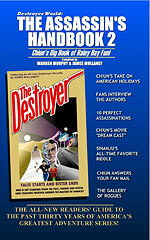 Inside you will find the all-new Destroyer Novella False Starts and Bitter Ends by James Mullaney, a unique interview of the authors by the fans of the series, and an original short story, "The Man in Room 36E." And a whole lot of Chiun! There's a lot more to enjoy inside these pages than we can list here.